A heartwarming tale about weathering change and what it means to be family. 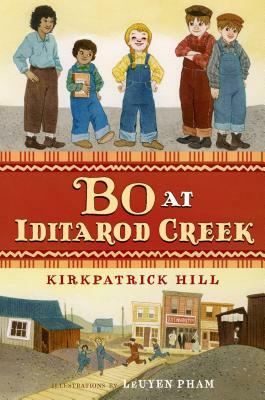 Ever since five-year-old Bo can remember, she and her papas have lived in the little Alaskan mining town of Ballard Creek. Now the family must move upriver to Iditarod Creek for work at a new mine, and Bo is losing the only home she's ever known. Initially homesick, she soon realizes that there is warmth and friendship to be found everywhere . . . and what's more, her new town may hold an unexpected addition to her already unconventional family. As with Bo at Ballard Creek, this stand-alone sequel is a story about love, inclusion, and day-to-day living in the rugged Alaskan bush of the late 1920s. Full of fascinating details, it is an unforgettable story. Kirkpatrick Hill lives in Fairbanks, Alaska. She was an elementary school teacher for more than thirty years, most of that time in the Alaskan “bush.” She has written several books for young readers, including Toughboy and Sister, Winter Camp, and the award-winning The Year of Miss Agnes.